My average burrito completion rate is 60%. Then I eat the rest for whatever my next meal was supposed to be. Burritos are amazing, when I can taste things again I’m going to go get one. Or maybe those tacos that come with the chips and salsa? With guacamole! mmmm…. guacamole. 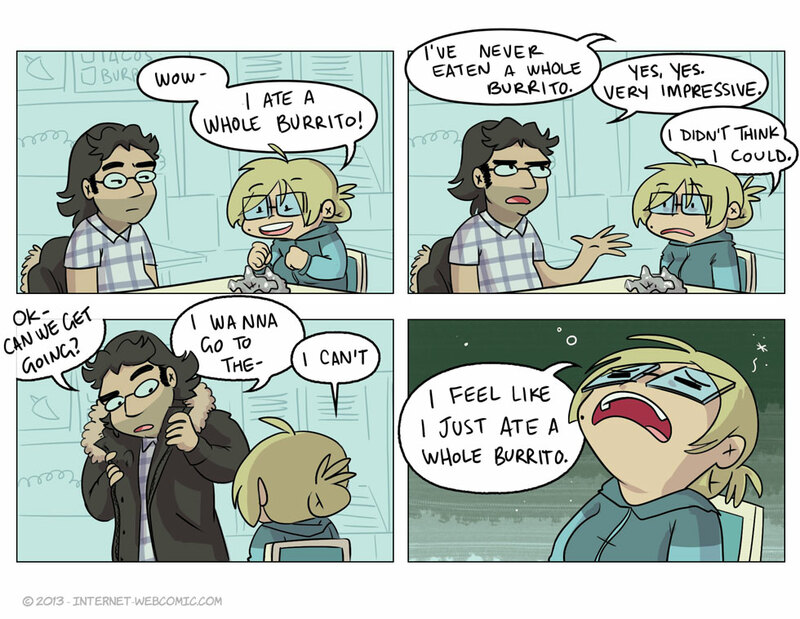 Ugh, those burritos. It takes me about an hour+ to eat one. Meanwhile, everyone else I’m with finishes in 10 minutes. Qdoba… my gf eats half of hers, I eat all of mine and regret it a bit, the bf eats all of his and tends to finish my soda…. I’ve been hungry for a burrito for the past day and a half, now. Hate you a little bit. … Am I the only one that can’t eat those delicious food-tubes? One bite and I regret it immediately. You’re not. Though in my case it’s more due to no burrito available in my home nation as far as I know. At least no american style ones. Not sure if you’ll even find a place serving those on this whole continent. You probably guest it: Europe (Switzerland to be more precise). It’s basically double burritos because I eat the other half later. I’m going to guess this is more a Taco Del Mar burrito than a Taco Bell/Time burrito, which are generally not much bigger than a hot dog weiner.